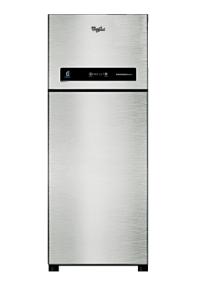 Compare Whirlpool Double Door 340 L Refrigerator PRO 355 ELT 3S and Single Door 215 L Refrigerator 230 Imfresh Roy 5S Exotica. You can see list of our Whirlpool IF 355 ELT vs Imfresh Roy 5S below, perform Side-by-Side comparison. If you need further help, do have a look at Conzumr Guides and Tips. Alternatively you can view all Refrigerator to choose your own favourites. This refrigerator has scientifically designed air tower, which has strategically placed vents that let out cool fresh air to different sections of the refrigerator so that there is uniform cooling all around. There is an Integrated vent at the bottom of the Freshflow air tower, that has effective anti-odour action of Active Deo, which keeps the refrigerator environment fresh and odour-free. Now small vegetables will never get lost inside the refrigerators- thanks to the mini crisper. The fresh-n-sort that fits perfectly inside the vegetable crisper not only gives you easy access to small veggies but also acts as a crisper separator. The fruits and vegetables in your refrigerator will taste just as nature intended them to be. The new Ice Magic Fresh range of refrigerators, powered by revolutionary 6th Sense Fresh Control Technology maintains freshness of fruits and vegetables for up to 7 days* - so that they taste just as freshly plucked from the garden.Unique Crisper with an Advanced Moisture Control knob, Freshonizer and Hexafresh Technology maintains optimum moisture in your vegetables and keeps them garden fresh for up to 7 days.In Insulated capillary technology, the capillary which carries the refrigerant from the Compressor to the freezer is surrounded by super cold gas leading to benefits such better compressor efficiency, faster cooling and 12 Hours cooling retention in the refrigerator. 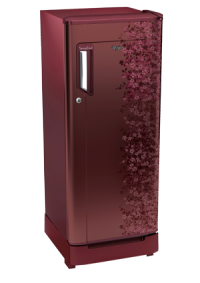 To Recieve updates and possible rewards for Whirlpool 230 Imfresh Roy 5S Exotica (215 LTR) Wine Exotica please sign in. To Recieve updates and possible rewards for Refrigerator please sign in.